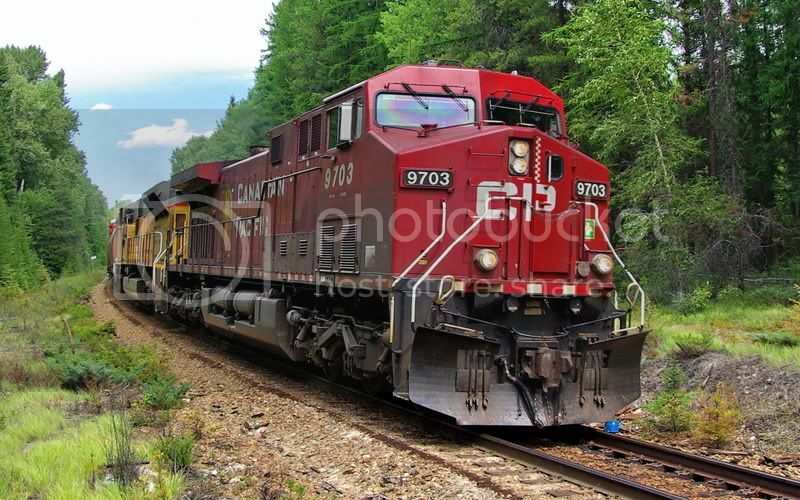 Two photos of a west (south) bound international train on CP's Nelson Sub at Moyie Lake. 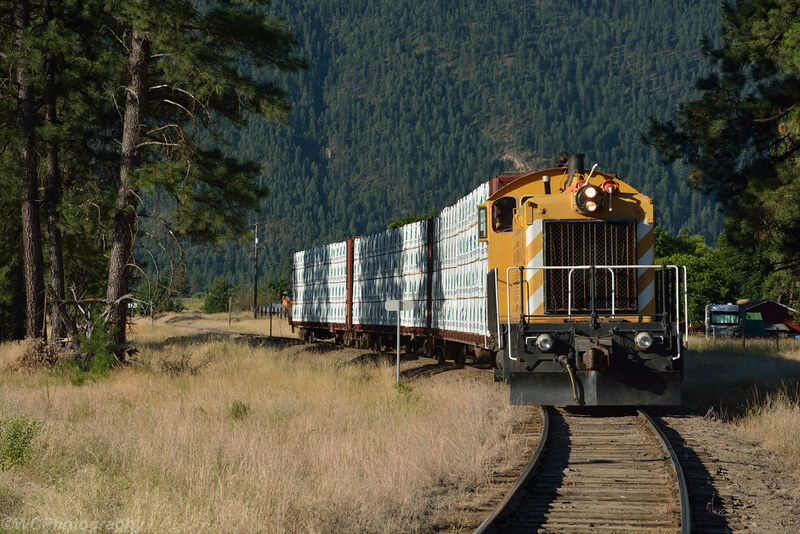 The train was destined for Kingsgate, on the border, and an interchange with Union Pacific. Note the Union Pacific locomotive just behind the lead CP unit. 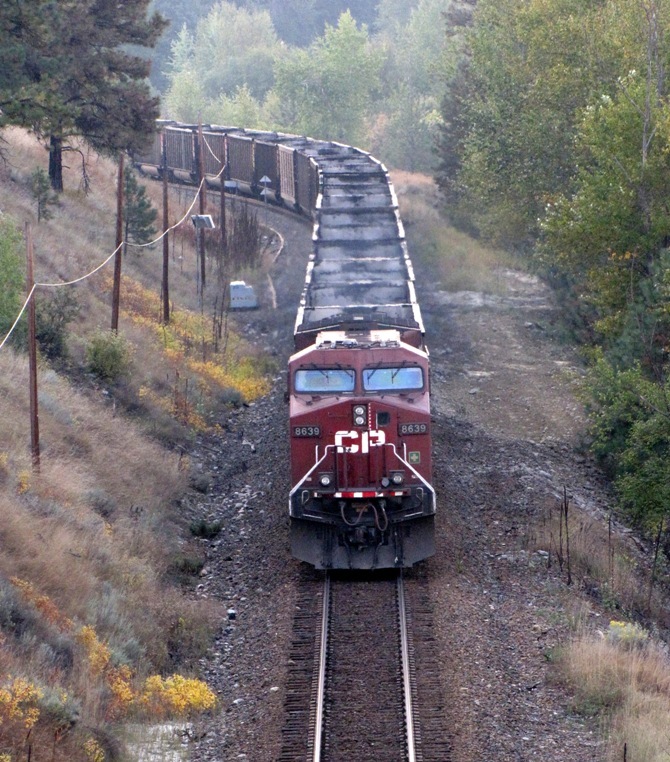 An empty coal train going back to the East Kootenay for another load. 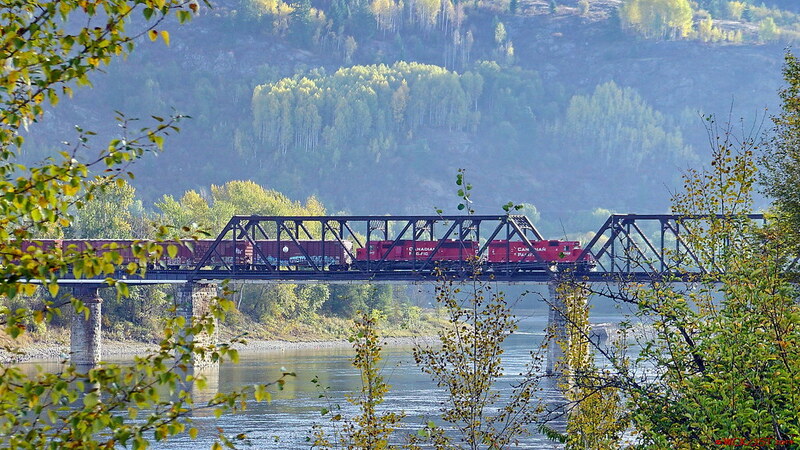 A couple of views of CP mixed freights in south-east BC. This lovely spot is the south end of Columbia Lake, just off Hwy-93, just north of Canal Flats. - seen in afternoon of September 16, 2014. The lovely scene, which I found on Google Maps, and saw in real-life today. 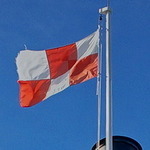 A new thread for the bottom-right corner of BC. - morning of September 17, 2014. 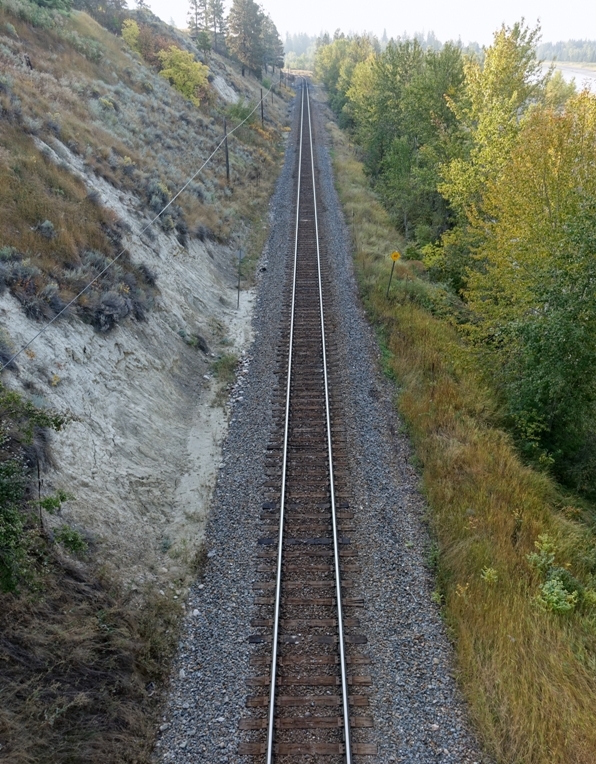 Grand Forks Railroad Company has 3.7km of trackage, all in an industrial area in south Grand Forks, BC. 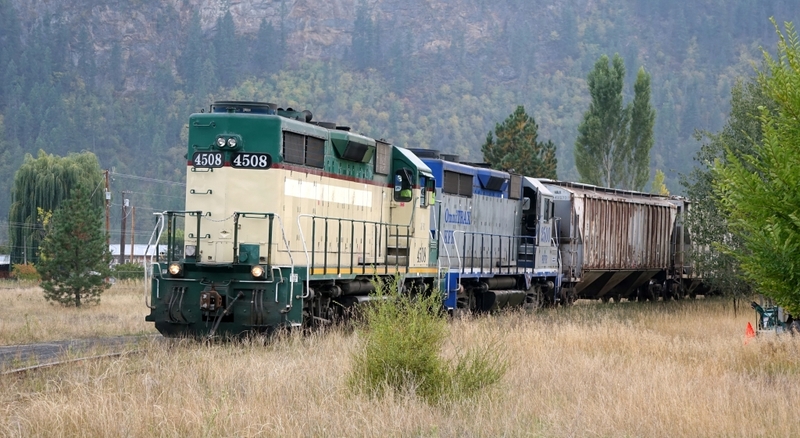 The link is to a US line (KFR: Kettle Falls International Railway) at Danville. 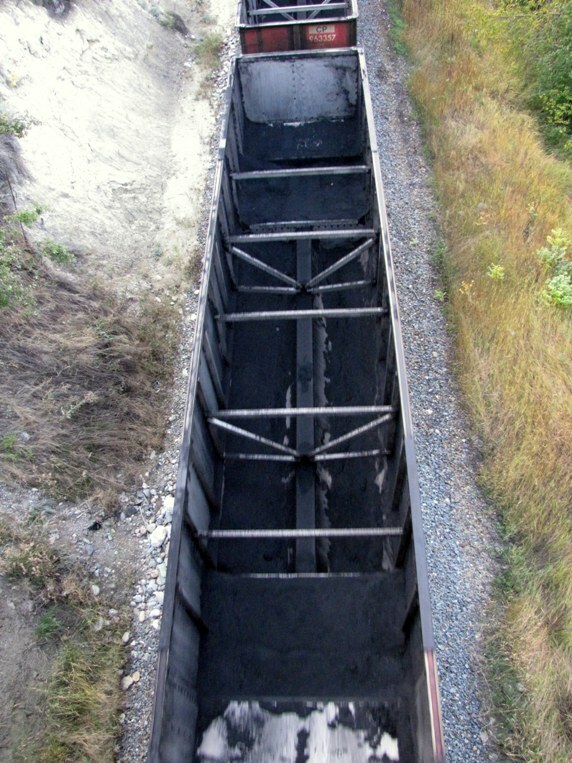 Here is the company's locomotive, seen on its way into the Interfor site. Seen by me on September 17, 2014. 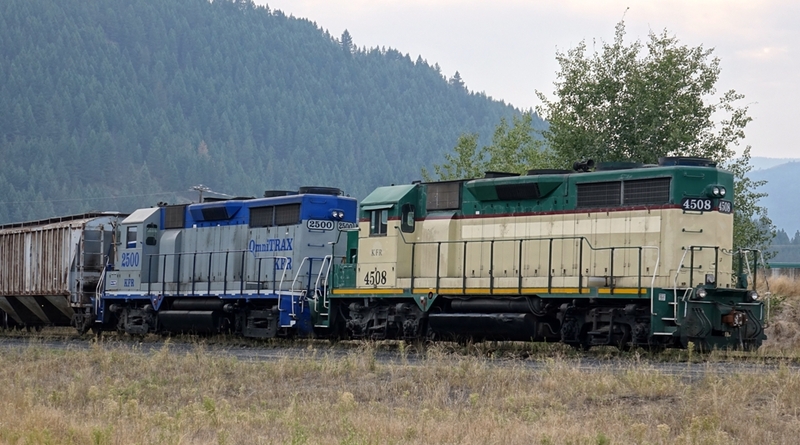 KFR - Kettle Falls International Railway units at the wye, in Grand Forks, BC. - evening of September 17, 2014, on Carson Rd. Fun Fact: the road near the wye is called "Big Y" road, and so is the local fire department. 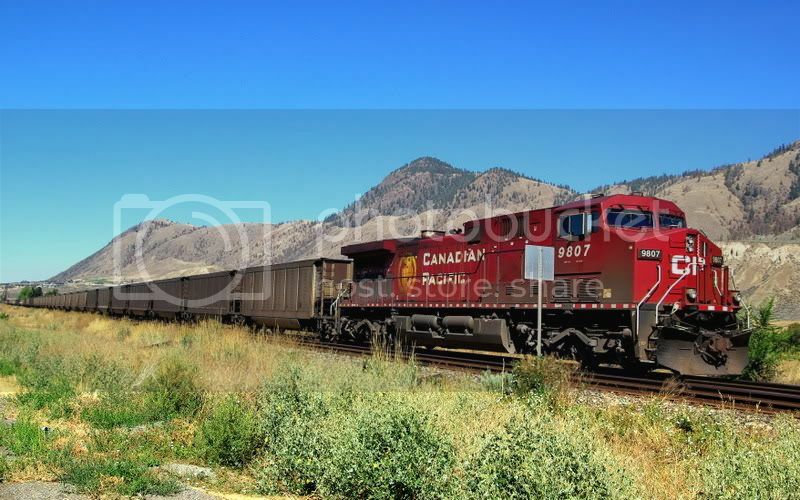 You might recall a discussion we had some time ago regarding one of those BC 'Stop of Interest' historical signs down in the Similkameen country by Keremeos entitled 'An American Railroad'. 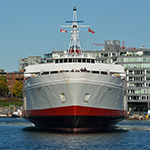 It was about J J Hill's Great Northern BC subsidiary, the VV&E (Vancouver, Victoria & Eastern). 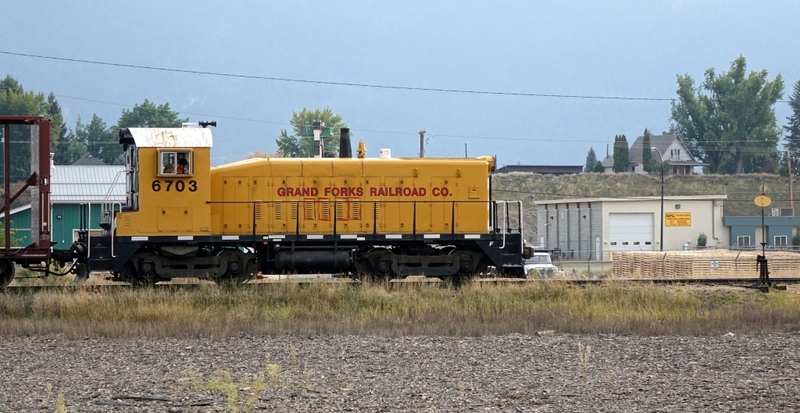 The short bit of operating railway at Grand Forks is a remnant of the VV&E, operated until not that long ago by the GN's successors, Burlington Northern, and later the BNSF. 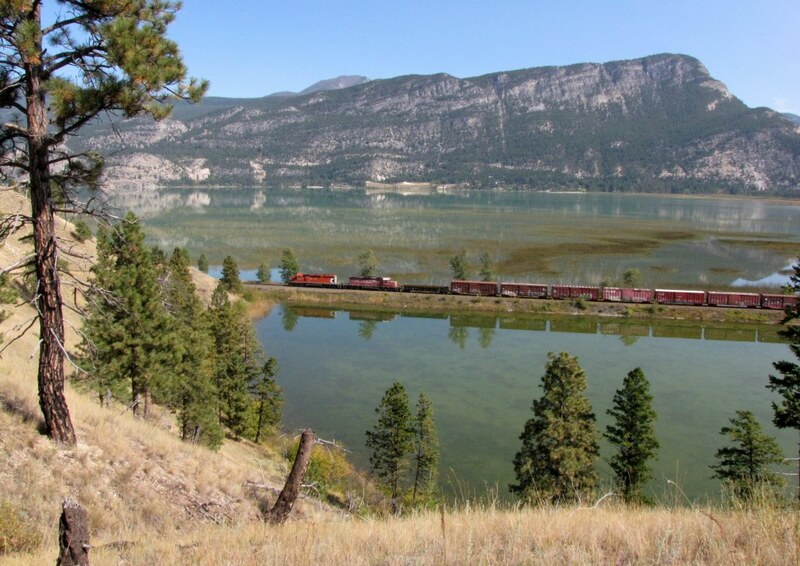 Grand Forks was also served by a second railway, run by J J Hill's arch-rival, William Cornelius Van Horne, the KVR (Kettle Valley Railway, a CP subsidiary. 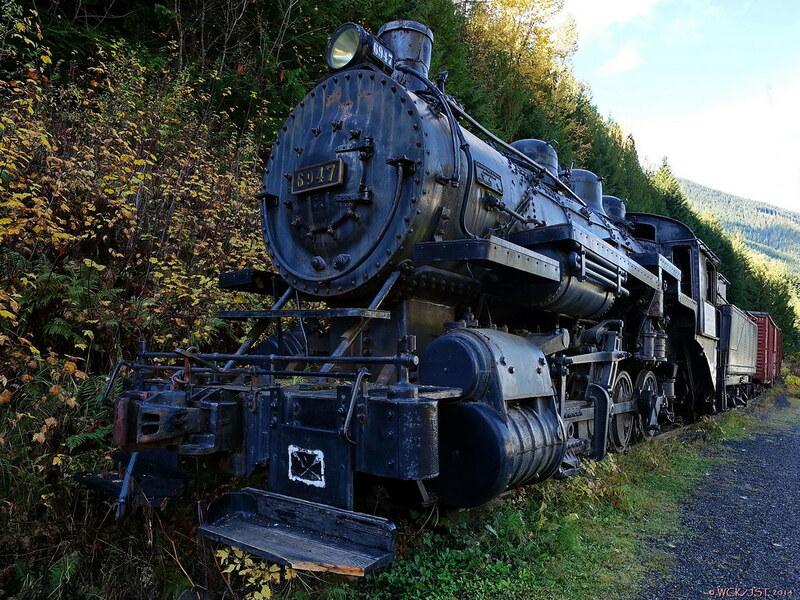 The former KVR line through Grand Forks was abandoned about 25 years ago, leaving the little bit of what once was part of the VV&E as the soul surviving operational railway in that part of British Columbia. 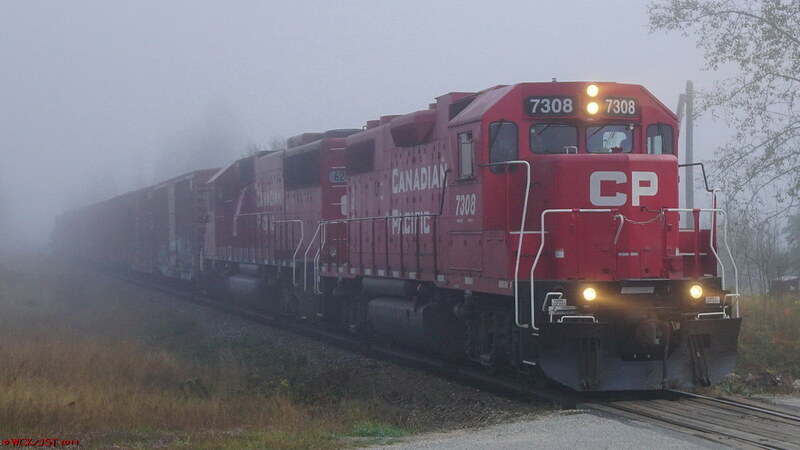 Here's my video of 2 CPR mixed freights on the Windermere Subdivision. - seen at Columbia Lake, BC on September 16, 2014. This is a nice spot to watch a train. Right next to Hwy 93/95, just north of Canal Flats. Nice footage. Looks like you're getting good use of your gear! Here's a brief video of the Grand Forks Railroad train crossing a road. Very brief, and it's mainly the empty rail cars. aha, you'd have been close to the Glade ferry. Or at least somewhat close. 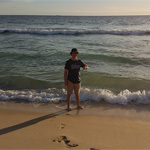 ps: typo in your photo date. Alas, there was a heavy Glade mist. So I still have yet to lay eyes on that one. It was a foggy morning... The April - October mix up has been corrected. Lovely. I was recently reading about this bridge (this is THE original bridge), in my copy of "Steam Along the Boundary" by Turner/Wilkie. The old Robson ferry crossing was very close to this bridge's location. 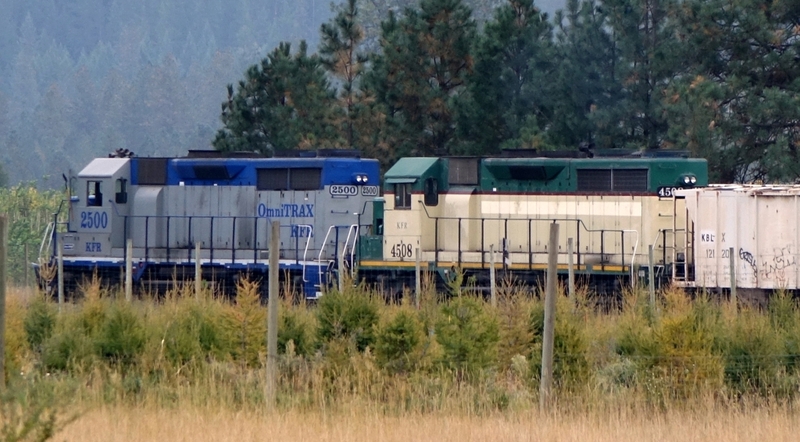 My video from mid-September 2014 of the mighty Kettle Falls International Railroad, at Grand Forks, BC. I'm at the big-wye interchange on Carson Rd, as 2 locomotives pick up some cars from the Pacific Abrasives yard. 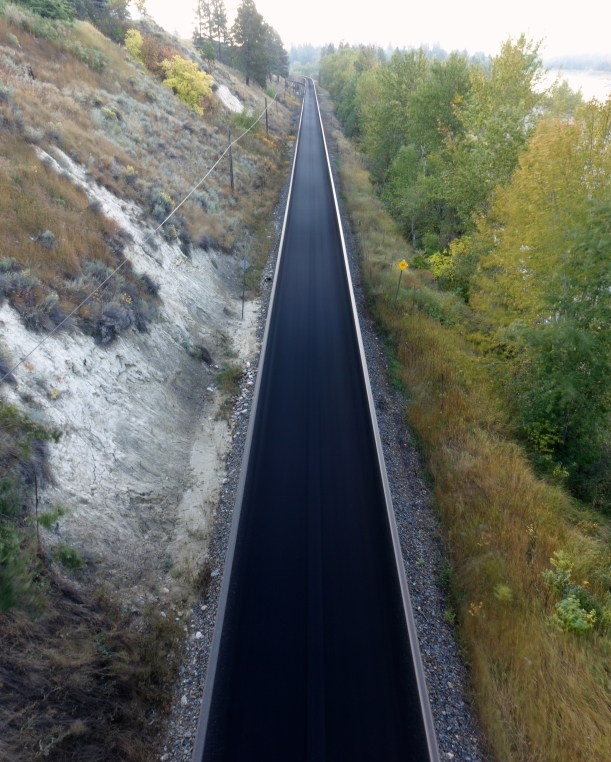 Here's my video of the empty coal train that I saw near Cranbrook, from above the track on the Ft. Steele highway bridge. 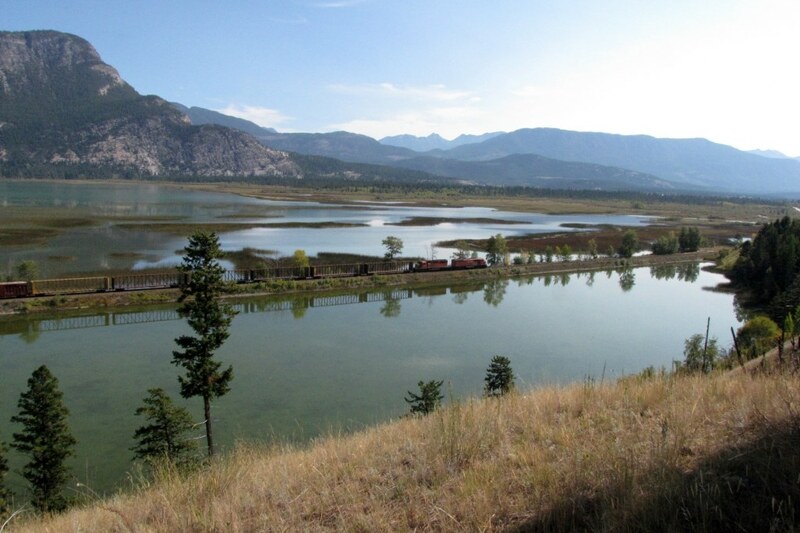 A few more views of the lovely scene at Columbia Lake BC, on CPR's Windermere subdivision. This is the south end of Columbia Lake (you know, the source of the mighty Columbia River), Hwy-93 roadside, just north of Canal Flats BC. - noon on September 16, 2014. Even better with a train. Nice reflections. 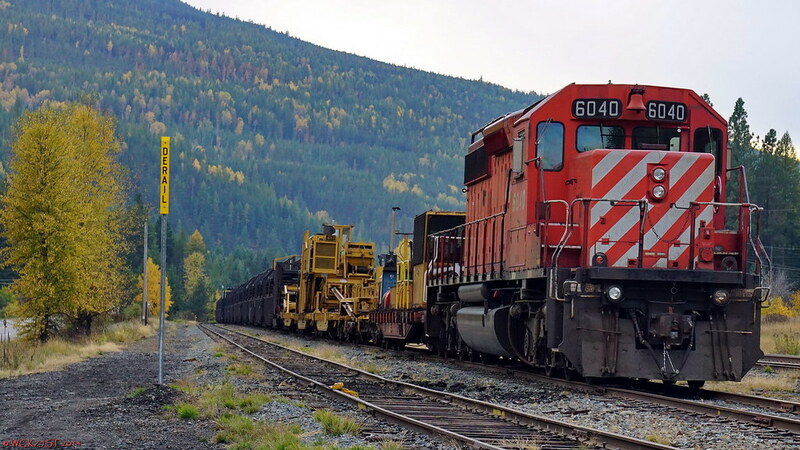 Old CPR locomotive, tender & rolling stock @ Sandon, BC, in the Silvery Slocan country between the West Kootenay & the Arrow Lakes - 7 October 2014. 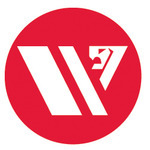 - Current Owner: Wrightway Charter Co. Ltd.
- Current Status: Static Display, undergoing cosmetic restoration. (originally #1737) of the 2-8-0 Consolidation class was built at the Montreal Locomotive Works in 1908 for the Canadian Pacific Railway. It spent its first years as a mainline locomotive before being re-numbered #3537 and assigned to branch lines. 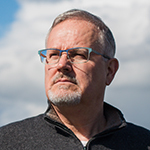 From 1926 to 1928 it worked here in the C.P.R's Kootenay Subdivision. In 1928, the locomotive was converted into a switching engine of the V-4-A class and re-numbered #6947. The pilot axle was removed at this time making it into the 0-8-0 configuration. #6947 served the C.P.R. in the Winnipeg and Moose Jaw yards until 1959 when it was sold to the Manitoba and Saskatchewan Coal Co. where it finished its working life after six decades of service. In 1998 this engine was purchased by Wrightway Charter Co. Ltd. of Sandon and moved to this location for restoration as a permanent exhibit of an early 1900's freight train. #6947 remained a coal burner until the end of its career. 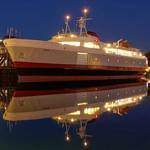 The weight of the engine including tender is 261,000 pounds. 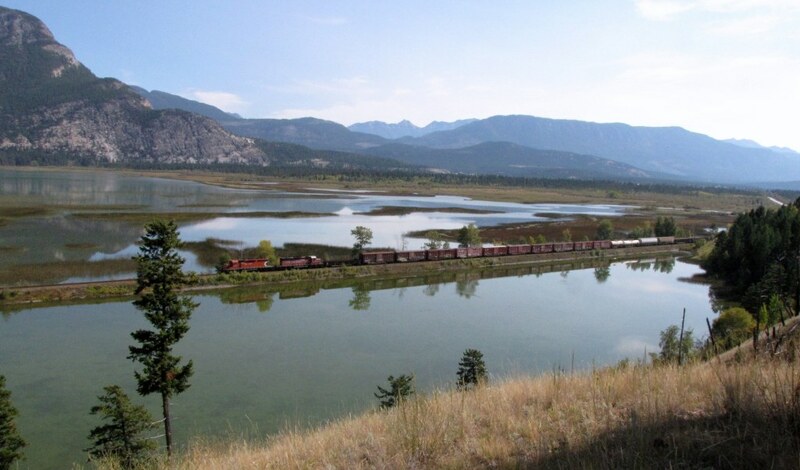 The Canadian Pacific in south east BC, specifically at Yahk, along the Crowsnest Highway (#3) between Creston & Cranbrook. 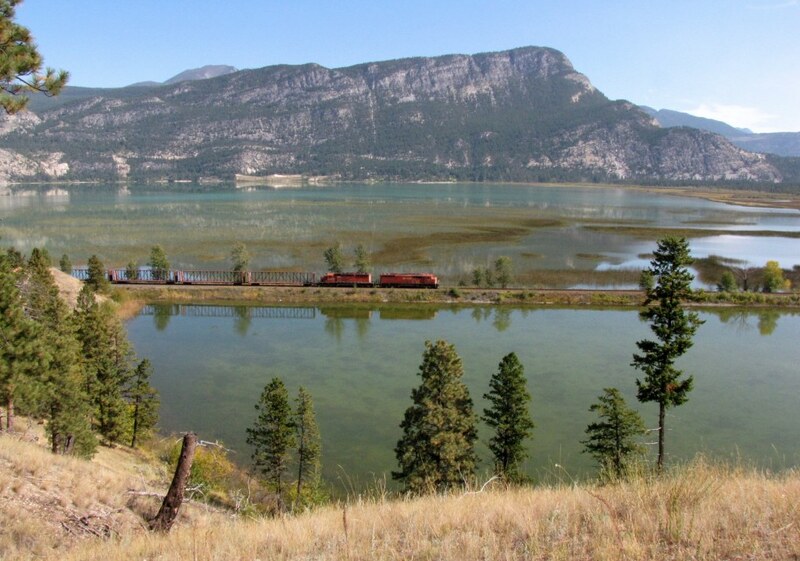 This is on CP's Crowsnest Pass route which comes from Lethbridge, Alberta, through the southern Canadian Rockies via Crowsnest Pass, and then west to the towns of Cranbrook, Nelson, & Castlegar. 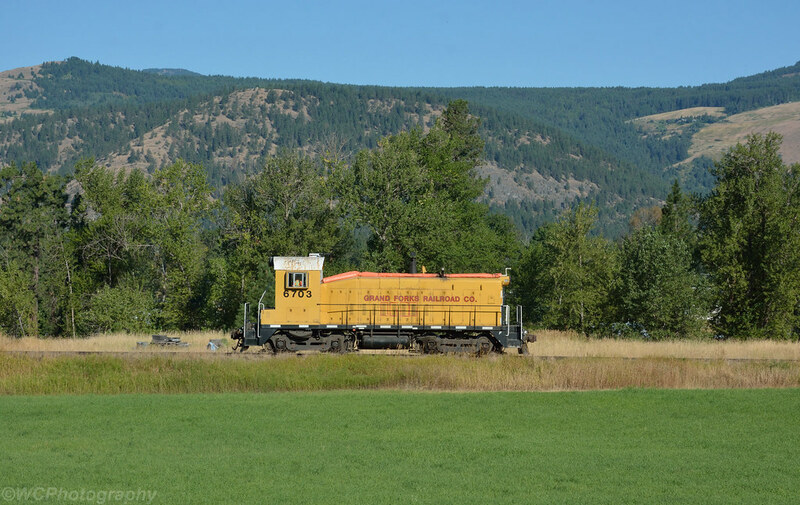 In the past this was CP's 'southern main line', a continuous route which included the Kettle Valley Railway, going all the way west to connect with the CPR mainline near Hope, BC. Once upon a time there were daily passenger trains in both directions. The tracks between Castlegar & Hope are now long gone . 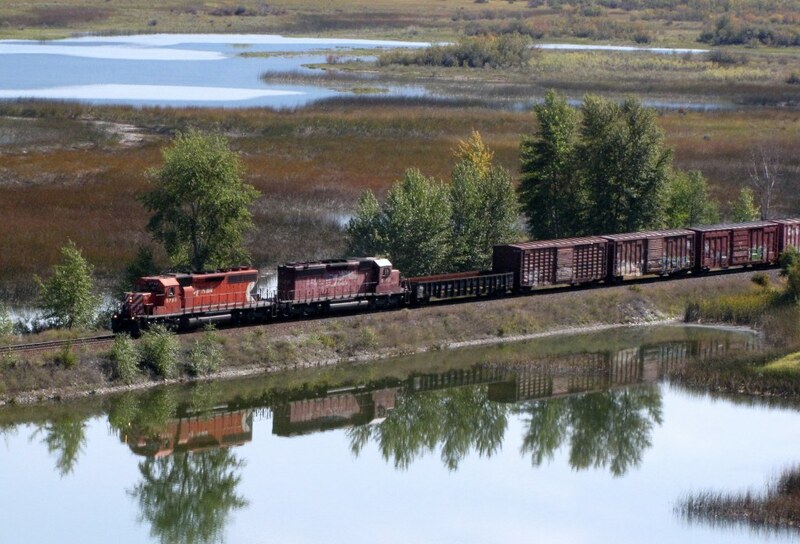 Two units of the Kettle Falls International Railway, operated by OmniTrax. 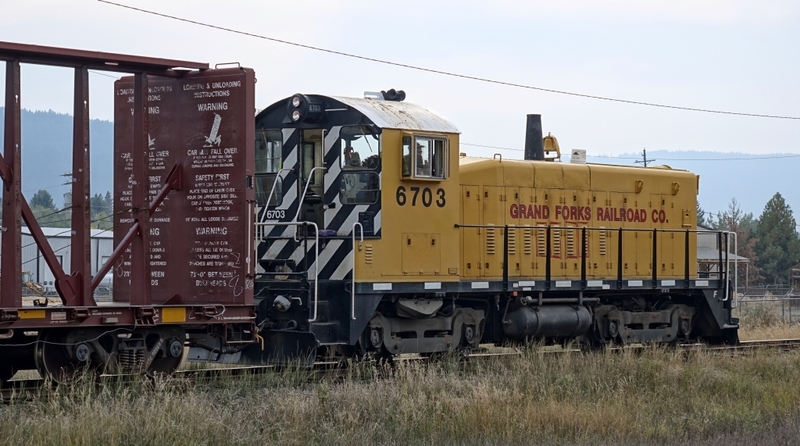 - seen at Grand Forks in mid September 2014. 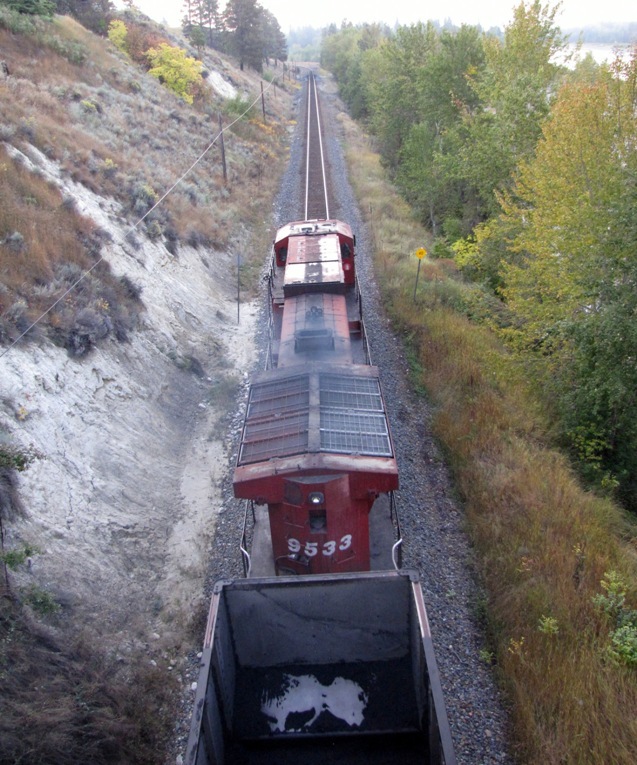 And the tail end of an empty coal train, headed back to the coaling area of south-east BC. Seen from the highway bridge at Fort Steele, BC. 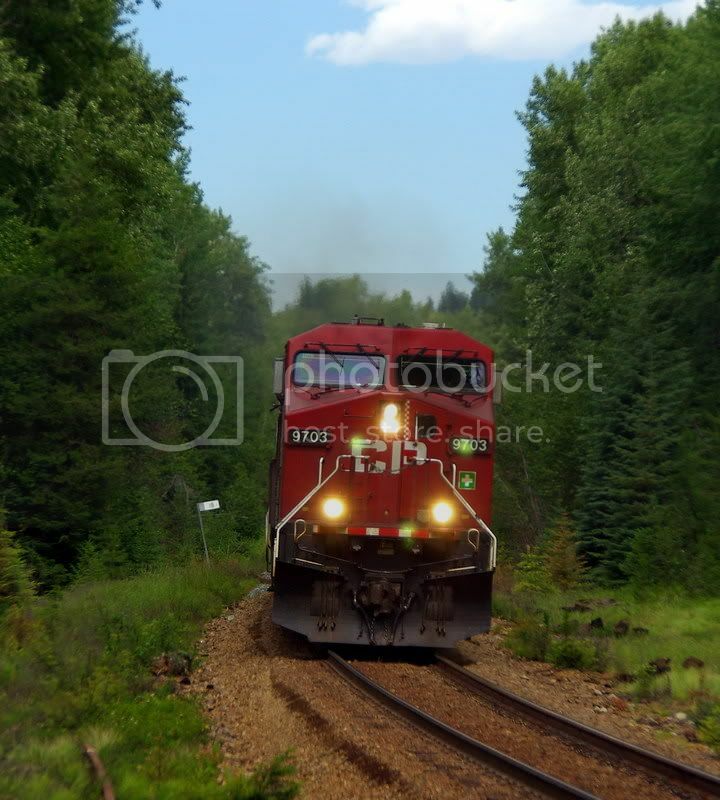 A couple views of the Grand Forks Railroad in action. 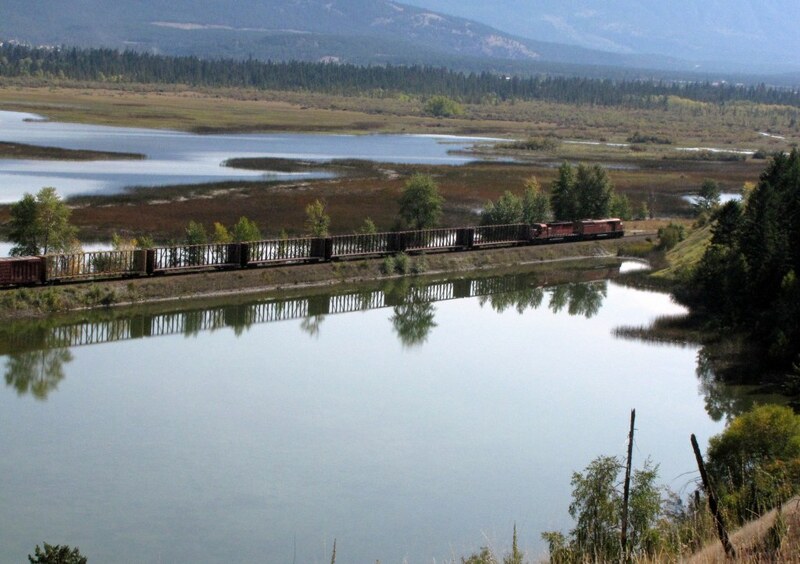 The GFR operates 3.7 miles of ex CPR track, some of it originally Kettle River Valley Railway track, a company acquired by the CPR in 1911. A pair of GP20C-ECO's lead the Golden Wayfreight through Canal Flats on CP's Windermere Sub.